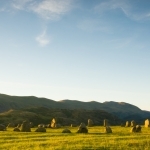 Castlerigg Stone Circle. This is a famous monument on the outskirts of Keswick, surrounded by mountains. The main circle has 38 large stones some standing up to 10 feet, (3 metres) high, with an entrance that lines up with the midwinter sunset. It is one of the Britain’s earliest stone circles, at about 5,000 years old and has been official protected since 1883. To this day it is a very popular and must see monument when visiting Keswick and today is managed by The National Trust and English Heritage. A couple of miles out of Keswick to the east, is the village of Threlkeld, to the south of which can be found Threlkeld Settlement. This was a substantial settlement dating from the late Bronze Age through to Roman times. It was a farmstead with seven circular stone huts, a well, livestock pens, fields and two trackways linking it all together. At the edge of the fields are about fifty cairns, probably created when the land was being prepared for farming. Travelling further afield we find White Raise Cairn. Standing 6 feet high and 72 feet across on Askham Fell, its the most visible of a clear line of cairns and standing stones. Excavations in the 19th century found human remains in a stone lined grave inside the cairn. Stone burial mounds of this type a typical of the uplands in the Bronze Age. About 2.5 miles west of Broughton in Furness is Swinside Stone Circle. 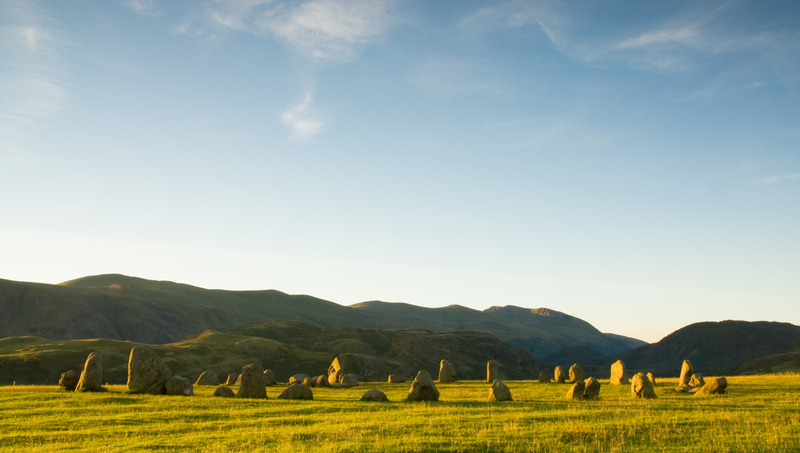 This stone circle, like Castlerigg is one of the finest in Britain. It has 55 stones up to 10 feet high and is also from the Neolithic period with an entrance facing the midwinter sunset. It’s other name is “Sunkenkirk” coming from the legend that people tried to build a church there but the Devil kept pulling it down. Copt Howe Rock Carvings, In Great Langdale, 250 metres south of Harry Place Farm, these mysterious carvings are up to 6,000 years old. There are circles, lines, cup marks, (small hollows in the rock), and some abstract shapes. Some of the “cups” are natural, but have been incorporated into the design. It is not known what they are for but archaeologists believe they may have been a way of showing links between people and important places. There are signs that people used the caves in the area during the late Palaeolithic period, around 11,000BC. With sea levels rising people moved inland to higher ground. Neolithic settlers cleared patches of forests for farming and build stone circles like Castlerigg and Swinside. They also made polished axes from the volcanic stones quarried high in the fells, these axes were traded as far away as Ireland. 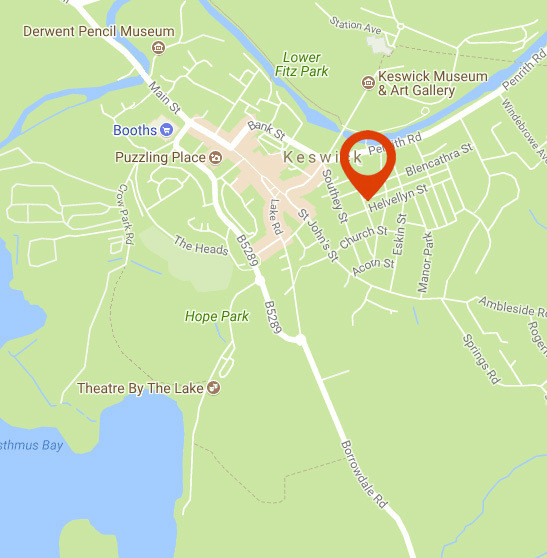 This is just a taster of the history surround Keswick and in the Lake District. There is so much more to find out about and explore. People have lived here in the Lake District for over 12,000 years. Their actions have shaped the landscape that we see today. They have left behind a wealth of evidence, from barely visible hut circles to triumphs of Victorian engineering. Using Keswick as an excellent base from which to explore these sights, either on foot, bike, car or bus. Contact us at Leonard’s Field House for availability, so we can not only provided you with a comfortable starting point from which to explore the lakes, but we can offer you advice so that you make the most of your stay.